bareMinerals New Get Started Complexion Kit in Light will give you glowing, healthy-looking skin and it even comes with a Get Started DVD to give you tips on looking flawless. Worth £108. This bareMinerals New Get Started Kit in Light is award winning and that’s no surprise when you think you get everything you need for a simply flawless and gorgeous complexion. Ditch the cakey foundations and create a sheer and natural looking coverage which covers blemishes and imperfections. A pure mineral loose foundation for a flawless complexion. A natural mineral complexion booster that infuses radiant light into your skin. A translucent finishing powder which perfects the skin. bareMinerals Full Flawless Face Brush. Soft, semi-round, medium brush head. bareMinerals Flawless Application Face Brush. Perfect for a broad range of applications. bareMinerals Maximum Coverage Concealer Brush. Provides full and concentrated coverage. 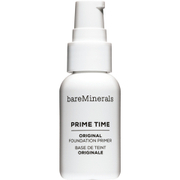 bareMinerals Prime Time Foundation Primer – 15ml. A foundation pimer designed to combat flaky dryness, fine lines and excess oil. Gives you tips on creating a flawless complexion. Prompt delivery (I am in Austria). The price is just excellent. I got this set for only 42 EUR and of course the products are amazing too. It's bareMinerals, you can't really complain. I love Lookfantastic. I really like this kit! Very good price in comparison to what I would have to pay here in Sweden. Natural looking skin but the coverage is this just good enough! Would recommend if you don't want a full face of makeup everyday. Love this light-weight make-up. Very natural look and feeling. Fantastic value for great products and brushes. I really expected this to be a good product and it actually is amazing! I have problematic skin and it covers everything and at the same time looks so natural and not cakey at all. I have an oily complexion so choosing a right foundation that stayed on my face for the whole day is very tricky. The Bare Mineral kit does work for me, it has a light, velvety finish that doesn't give impression that you have a tone of fluid on, yet it covers what you need it to cover. My skin is far from perfect with patches of redness and big pores and from all the foundation products I tried so far (from L'Oreal to Estee Lauder) - Bare Minerals had the right consistency, coverage and it stayed on the longest. Because everything is in powder it is very easy to cover the whole face. I only had 2 minor issues with the kit: the 'fairly light' foundation that I use as a concealer for the redness around my nose - clogs up a little (especially in the hot days). The 'All Over Face Colour in Warmth' - is too dark for me. Apart of that I highly recommend the product - and once you tried it - you can buy products from their full range. This is one of the best sets I ever tried because you get to try two shades of the original foundation so you can mix them to get your perfect shade and you get the bronzer and mineral veil, not to mention the primer. It also comes with the brushes they recommend to apply the powders which makes this even better. My skin has gotten better since I switched to mineral foundation. I recommend this 100%. Wow, where have you been all my life?! Being a foundation junky since my early teens I can't believe it's taken me so long to try this ! I have extreme combination skin with a very oily T-zone and crazy dry patches around my nose and varies other parts now and then,but this mineral foundation has an amazing way of dealing with both - provided you moisturise and prime before hand (which regardless of which foundation you're using you should always be moistening/priming before hand anyway) It's such an amazing product, the only way to fully understand how good it is, is to try it. Best key feature of this product is it's durability, 5 hours into your day after having applied your mineral foundation, you'll notice how freshly applied it still looks :) Worst feature . . . It is a loose powder so things can get messy during application, it just requires a little bit more care and attention that's all, but still well worth it . One of my friends put me up to try BareMinerals. Since I never used it I was hesitant to buy from this pricey range. I was not sure about the shade that I would need and with which products to start. This kit provides everything that is needed for a start using mineral make up. And it is a great value. Since there are two different shades of foundation in this kit it is great to give it a trial. The DVD is most instructive and even the brushes are provided. Although they shed a lot (hence just 4 stars) I appreciate them. I love to use this kit and I am sure to buy more of the BareMinerals range soon! I've always been skeptical about powder foundations but after trying this I'm hooked. It's really natural looking but with far better coverage than I have ever had with liquid foundations. I find it is great for my skin and I haven't had the usual outbreaks I get after I use other types of make up.